We are offering a new Group Coaching Program beginning in January. Watch for more information coming next week. Local Seminar: Leslie will be doing a local seminar on “Becoming the Best Possible You” on Saturday Morning - January 18th at Jordan UCC Church in Allentown, PA.
Thanksgiving is a time for food, family gatherings and football. Once everyone is gathered at the table, my husband asks us to share what we're thankful for. I'm sure many of you do likewise, but from now on, don't make thanksgiving a once a year occasion. For a long time I couldn't grasp WHY God would command us to be thankful in everything, even the bad things in our life. As a counselor, I thought that bordered on craziness. But I have learned that when I discipline my mind and heart to give thanks, even when things seem negative to me, my attitude changes. I am not as unhappy, as critical or as complaining. We live in a world where people feel grumpy and miserable much of the time. They complain that life, God or other people don't give them the things they feel they deserve. This entitlement thinking breeds more discontent and unhappiness. The apostle Paul said that he “learned to be content” in plenty and in poverty. He could experience joy in both circumstances. How did he do it? The gateway is gratitude. Learn to be thankful in all things for this IS the will of God. "It is good to give thanks to the Lord" (Psalm 92:2). Gratitude pleases God. A thankful spirit also blesses others, leading to happier relationships. What would be different today if instead of complaining or commenting about what wasn’t done at home, you would purpose in your heart to look for something at home you can be thankful for. For example, thank your husband for working hard at his job, or thank your wife for making dinner tonight. "Two men looked out prison bars. One saw mud, the other saw stars." Both were present, but which one would you rather focus your attention on, mud or stars? It's not just God's word that encourages us to be thankful. Recent studies in positive psychology confirm that grateful people are happier people and being thankful for specific things, brings us joy. Learn to look for the good, even in difficult situations. Practice gratitude every day. If you do, you will find that your spirit is on its way to learning greater joy and contentment with your life leading you to deeper happiness. I am thankful for all of you. 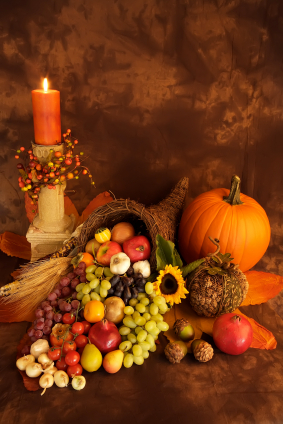 May you have a wonderful Thanksgiving weekend! Question: I’ve had a number of questions recently from those who want to know what a healthy marriage looks like. Obviously in a blog I cannot do this question full justice, but I thought a short excerpt from my newest book, “The Emotionally Destructive Marriage”, perhaps says some things in a way you haven’t heard before. Excerpt: Many of us have grown up in homes where sinful attitudes and destructive behavior are accepted as normal. We’re so used to being mistreated or disrespected, controlled and manipulated we don’t recognize it as such. On the other hand, some of us grew up on a steady diet watching Hollywood and Harlequin’s version of love and marriage. They portray unrealistic and distorted ideas around love and marriage as well. They want us to believe that if you have enough sexual passion, the rest of the relationship is easy. It’s a lie. Let’s look at what are some of the foundational ingredients for a marriage to be healthy and why these basics are crucial if a marriage is going to flourish. Every grown-up relationship requires three essential ingredients to thrive: mutuality, reciprocity, and freedom. Mutuality means that both individuals contribute specific qualities essential for the care, maintenance, and repair of the relationship. They are honesty, caring, respect, responsibility, and repentance. In marriage, both individuals make efforts to grow and change for the welfare of the other and the preservation of their relationship. 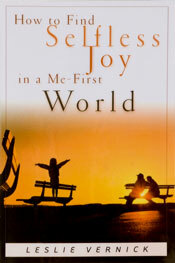 How To Find Selfless Joy In A Me-First World by Leslie Vernick. Plus see the winner of the previous give away! Western Culture increasingly emphasizes the importance of self-love and self-esteem. Many of us believe we must “find” ourselves – and feel good about what we see – before we can experience significant spiritual growth. Focusing so much on ourselves, however, distracts us from pursuing the only source of true fulfillment. Do we, as God’s people, really need to love ourselves more? Or is there a wiser, biblical path that can lead us to joy that is not self-centered and fleeting, but God-focused and lasting? Challenging the current fascination with self-esteem, Leslie Vernick answers these questions and others that trip up Christians today. Offering surprising insights and practical helps that can make a real difference in your life, she shows how you can experience greater personal, relational, and spiritual growth while humbly adoring and glorifying your God. To win this book, please email your name to assistant@leslievernick.com with "Book Give Away" in the subject line by midnight Sunday, December 1st. The winners of “Partly Cloudy with Scattered Worries: Finding Peace in All Kinds of Weather” by Kathy Collard Miller are: Sandy W of Waxhaw, NC and Uriesou B. of Milton, FL. "Leslie developed a wonderful rapport with the women, whatever their age or stage in life. She has excellent verbal skills and seasons her talks with solid scriptural truths, personal transparency, and bits of humor. Her abilities to connect with our women and present a no nonsense approach are a gift from God."